Battery Park City is a great place this year for Macy's Fireworks viewing! Depending on the year, we either have the best views of the famed Macy’s fireworks in Battery Park City — or we’ve got nada. Lucky for us… this year is a phenomenal year for the Macy’s Fireworks!! The fireworks are set to begin at 9:20 p.m. and will have six barges along the Hudson River. The theme of the show this year is “American Harmony” which will feature music that emphasizes the glory of American history. The New York Pops Orchestra and the Mormon Tabernacle Choir will perform, and there will be unique versions of classic patriotic tunes performed by Straight No Chaser, Broadway Inspirational Voices, U.S. Army Soldierâ€™s Chorus, and United We Sing. The music will be performed in sync with the fireworks and can be heard on 1010 WINS. For those who prefer an HD and air-conditioned view of the show, NBC will broadcast the fireworks live beginning at 9 p.m. EST. 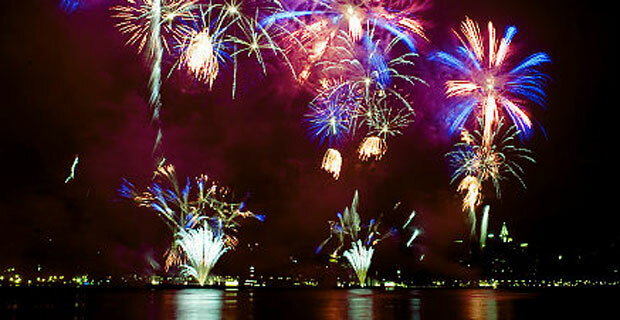 Fireworks will be launched from six barges in the Hudson River. 12th Avenue will be closed below 59th beginning at 4 p.m. for viewing. Pedestrians can access the 12th Avenue from 11th Avenue at 24th, 26th-30th, 34th, 40th-44th, 47th-52nd and 54th-57th streets. The West Side Highway will be closed to vehicular traffic from 22nd-59th Street starting at 4 p.m. However, the Macy’s Fourth of July fireworks are viewable from anywhere you have an unobstructed view of the sky above the Hudson River. An outdoor concert with Grammy award-winning singer and songwriter Rosanne Cash â€” bring a picnic and discover Governors Island!Free ferry service starting at 10am from the Battery Maritime Building at 10 South Street between Whitehall and Broad Streets, adjacent to the Staten Island Ferry. The Battery 4th of July Concert and Family Festival – Dan Zanes Jam & Jubilee: Enjoy a free performance by Dan Zanes Jam & Jubilee in Battery Park at 2 p.m. Details and directions available on their website. Space is available on a first-come, first-served basis. Big Onion Walking tours will have a 1 p.m. Â walking tour of sites related to the Revolutionary War in Lower Manhattan. Fraunces Tavern, the graves of Alexander Hamilton and General Richard Montgomery, and Federal Hall are among the sites featured on the tour. Admission: Adults $15, Seniors & Students $12. Meet at the intersection of Broadway and Murray Street, at gated entrance to City Hall Park. See the fireworks while you enjoy dinner, open bar, and live music on Spirit of New Jersey’s cruise from 6 – 11 p.m. (5 p.m. boarding) for $263.90 per person departing from Chelsea Piers. (Price does not include taxes, fees & required gratuities, which add about $80 per ticket.) Consult their website for details and reservations. The Zephyr boards at South Street Seaport Pier 16 at 6 p.m., sailing from 6:30-11:30 p.m. Tickets are $165 and $120 for children, and include live DJ and buffet dinner with a cash bar available.